Owners of period properties in the South East of England are looking to combine a heritage feel with modern luxury. 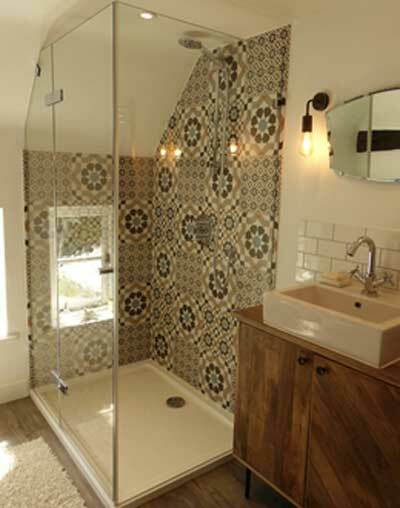 This desire is fuelling the growing trend for patterned tiles, especially in bathrooms and shower rooms. When combined with custom-made frameless glass panels, the result is one of distinctive style and practicality. This return to patterned tiles is more in keeping in a period property than a clinical white and chrome scheme. Patchwork, floral and geometric bathroom tile designs with a nostalgic character add a period quality to the room and create a unique finish that makes a striking statement. From Moorish to Vintage, and everything in between, patterned tiles are an excellent way to add colour and visual interest to an otherwise simple bathroom scheme. They are particularly effective for a period property, as is the growing preference for using natural materials like pure glass and wood. Individuality, heritage and craftsmanship are once again being favoured over mass-produced designs. High quality bespoke frameless glass bath and shower screens are ideal for older properties, which often have uneven or irregular walls, as they can be designed, manufactured and installed to ensure a perfect fit. The unobtrusive, barely-there look bespoke frameless lets the beauty of the decorative tiles to shine through and maximises the space and natural light of the room. If your period property has low, sloping ceilings or uneven walls and surfaces, our precision, made to measure frameless shower enclosure service could be the answer. You can see more examples of our custom-made glass projects here and for more information please email us at info@showerpower.co.uk or call 01403 829020.